Most businesses need to have their own copier and printer. It is one of the most important things they need to invest so that they can have their office run efficient as much as possible. Therefore, whether you are buying printer and copier for your small office, you need to ensure that you purchase the best equipment. You need to ensure that your equipment is really designed with the best features that will suit to your budget. There are some equipment machine that needs regular maintenance so because of this, ensure that you will take some of your time in comparing service agreements, brands and as well as its warranty before you make your decision to purchase. However, for you to look for the best Copier & Printer Sales, here are some keys you need to look for before you start purchasing it for your business. Look for its total output. Since you want true assurance for your equipment, make sure that your Copier & Printer Sales can handle the volume of printing that your own office needs. Most larger copiers with fax, print and other functions may be more suited to your office spaces or corporate environments wherein there are lots of multiple users. You also need to read some reviews about its previous service agreements with auditing tools or print shops and determine what is the average print volume that best fits in your office. Through this, it will become easy for you to choose the best Copier & Printer Sales that will handle print volume that is needed for your office. Learn about Multifunction products. You need to invest in a multifunction product that offers several functions and capabilities so that you can save your cost as well as the space in your office. Considering this kind of factor will provide you lots of benefits that you and your employee will surely love. Color. You can consider purchasing Copier & Printer Sales that will surely help you save money that uses black ink only if you will not print or copy files that are in full color such as images and presentations. Hard drive. Some of the printer or copier are equipped with hard drive wherein it allows users to store and transfer copies of documents electronically. Therefore, consider the business copier to that has hard drive built in that can help you accommodate the large scale of long queues and printing jobs. Furthermore, compare the hard drive features. Security and wireless printing. Ensure that your copier and printer have a security authentication system that only authorized person only can get access to it. Most of these equipment involves wireless printing wherein you are allowed to print remotely. Purchasing Copier & Printer Sales for your business is a big investment. Therefore, you need to compare its certain features to ensure that you make the best decision. In addition, think of the benefits of choosing the best equipment for your business. Once you have identified what you really need, then it’s the time for you to purchase your own. Please contact Ameritech Office Systems if you have any questions. We proudly serve Annapolis, Baltimore, Columbia, Northern VA. & Washington DC. Ameritech has been selling & and serving copiers & printers for over 25 years. It feels annoying when you want to get an essential print done and your copier or printer fails to work. In order to make things look worse, you will get warning and error messages spread over the entire screen. To bail oneself out of the situation, you can try to open up the paper tray to see the things if you will be able to fix it. As soon as you have made it a realization that you do not have any idea regarding the problem, it is time to ask for help from a printer and copier repair company in Maryland . Knowing some factors that you should take into consideration will help you save effort, time, and money from selecting the low quality service provider. The quality of service is one of the deciding criteria for choosing a copier and printer service provider to repair your machine. There is no doubt that you will be able to get inexpensive parts for your copier and printer. However, it is highly recommended to think again about your decision two times, for some of the sellers may be selling you low quality products and you may end up paying mounting bills for the printer and copier repair company in Maryland. Genuine parts may cost you more but they are always going to prolong the life of your copier and printer. It is very important when selecting any printer and copier repair company expert that these companies have excellent customer satisfaction, only then it will become worth the cost. You may need to call them once you try the next print as soon as your machine is done from repair. To be able to make an option for a certain professional repair man or company in Maryland, you have to always count on reliable names in your area. You will be able to check their reviews online and by spending a little time to research about the right company for your copier and printer repair, can make your decision look smarter. If you choose just any company or worse, a poor quality company, it may do more damage to your machine. This one is quite a dicey issue to deal with as the option of any copier and printer repair company will depend on your budget. It is recommended that you go with the best company in Maryland, but within your budget limits. One tip is that you must never choose too cheap and too costly repair service for your printer and copier. It is always advantageous to choose service providers who will charge nominal fees for quality repair service. A little research can save you from many troubles. Furthermore, it is a great idea to check the printer reviews before you buy a printer and copier. Always try to ensure the cost for your repair does not cost more for a new copier or printer. If repair is the answer, ensure that you always select the right and best printer and copier company in Maryland. Copier and printer maintenance contracts tend to be a wise decision when purchasing a new machine and can eliminate costly copier service and repairs. Several printers leave smudges on the pages, some are creating curls or creases on the paper jam or paper, and others are misprinting on papers. These are the most common calls from lots of printer customers. These printer and copier issues happen on all the printer models, which include plotters, color laser jets, laser jets, design jet, multi-function printers, and even the ink jet machines. The modern printers are very versatile and smart in their functionalities. Regular preventive maintenance and proper care will surely be able to enhance these machines’ productivity and life span, which saves you the headaches of having printer repairs. Even though manufacturers are providing all the information needed in the user manual or the copier and printer, end users do not commonly understand that it is their responsibility to know this kind of information. Here are some of the things that you can do to be able to enhance the life of your machine. You can also ask help from copier and printer maintenance contracts to do the job of maintaining your machine for you. Always try keeping your printer or copier from moisture and dust. As a matter of fact, dust is the biggest enemy of printers because it is causing jams and machine jams. It can easily penetrate the machine’s sensitive parts. You may be able to use either a clean cloth or air duster in clean wiping the dust that is accumulated on the laser printers. Furthermore, you may consider vacuum cleaning the printers if you have specialized tools to do the job on the machine. On the other hand, if you do not have these tools, copier and printer maintenance can help in maintaining it without worrying about having to damage the machine if you do it yourself. You will need to be really careful in doing the cleaning on your own, and you have to unplug the printer first. In addition, you must not use it on the complicated parts of the machine. Let the certified copier and printer maintenance company to handle this work if there comes some major problem to occur. They are going to check the paper pickup’s rollers for cracks and dust on regular basis, because these are the major cause of paper jam on printers. Finally, when asking help from reliable printer and copier maintenance/repair company, remember that these technicians are experienced and experts, having the source to all possible parts. Some of the technicians are really great in service, but in terms of the parts, they have limited access and this can create problem for the repair. A good copier and printer maintenance company or technician needs to always do his appropriate homework before he goes in the field to get the printer or copier fixed. He must always study the probable error problems so that he can begin to work on repairing the issue instead of doing the guess work through trial and error. Ameritech Office Systems offer Service & Maintenance Contracts for all Copiers and Printers. We offer same-day service and repair to help minimize the down time and keep your buisiness running smoothly. We have technicians in the field daily repairing Canon, Xerox, Ricoh, Kyocera, Sharp, Konica, Hewlett-PAckard, Toshiba, Fujitsu, Copystar, Dell and other other name brands. Amertiech Office Systems offers Service and maintenance contracts for printers and copiers in Annapolis, Arnold, Baltimore, Bowie, Columbia, Crofton, Edgewater, Glen Burnie, Laurel, Pasadena, Maryland. We specialize in maintenance contracts for churches, private schools, public schools, businesses, doctors offices and dentist. Please contact us for a free quote. If you’re in the market for a new office printer in Annapolis , you’ll need to decide between an inkjet printer and a laser printer. Laser printing options may seem complicated, but they are faster, easier to use and maintain, and less expensive than other types of printers. They also do not require printer repair services as often as other office printers. Watch this video for an interesting demonstration of how laser jet printers work. An office equipment and repair expert, Steve Munoz, discusses how laser jet office printers and fax machines operate so quickly and efficiently. This video can help you determine if laser jet office printers are right for your printing needs. With so many different types of printers in Annapolis, it may seem overwhelming to try to find the best office printer for your business. Ultimately, you need to consider your office equipment budget, your business’ printing needs, and what type of printer will work best within those parameters. Here is a simple guide to choosing the best office printer for your business. Not all offices have a specific budget for office equipment, but you should still try to decide on the maximum office printer price that you’re comfortable with. Meet with your accounting department to agree on a reasonable office printer budget. This will make it easier to filter through the multitude of different types of printers available at your local office equipment store. Your budget should take into account the size of your office, the cost of printer repair service and maintenance, and how much money you spend on office equipment in a year. If you have a large office that prints a high volume of documents every day, you’re going to need a high capacity office printer. You may even want to consider purchasing an all-in-one or combination device that operates as a printer, scanner, copy machine, and fax machine. Purchasing one piece of office equipment that handles all of these printing services will save you money, space, and stress in the long term. You should also determine whether you need a color printer, how many pages per minute your printer will need to be able to deliver, and what types of media and paper sizes you will be printing on. Once you have a basic sense of the best printer for your needs, you can begin narrowing down your office printer choices. You will need to choose whether you need an inkjet printer, laser printer, color printer, high capacity printer, or all-in-one printer. You’ll also have to ensure that the printer you buy falls within your office equipment budget. At Ameritech Office Systems , we have over 30 years of experience in sales, maintenance, and printer repair services in Annapolis. We are committed to providing the highest level of customer service in the industry, and are proud to offer same-day service on office equipment maintenance and repairs, and the highest quality of office equipment brands available. We also take care to provide personal service to each customer to ensure that his or her office equipment needs are met completely. In addition to providing copier and printer repair services and maintenance, we also sell office copiers, office printers, and basic office supplies. We can provide office equipment manuals, drivers, and tutorials to ensure that you and your employees know how to efficiently operate your equipment. We even offer document management services to further streamline your business and increase productivity and efficiency. Ameritech also offers in-house printing services for jobs both big and small. Our friendly, experienced staff can provide black and white printing, color printing, free pickup, and free delivery. All of our printing services are quick, affordable, and high quality. 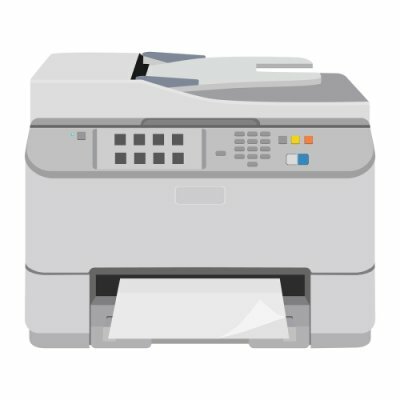 If you’re looking for the best office printer in Annapolis for your needs, you’ll have to decide between buying a laser printer or an inkjet printer. Each type of printer has advantages and disadvantages, and your choice will be determined by your office equipment budget and printing services needs. 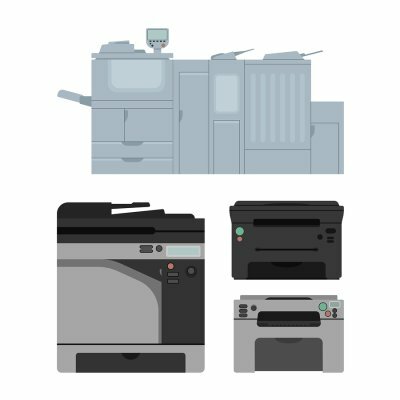 Here is a simple guide to deciding between a laser printer and an inkjet printer for your office. Laser printers operate by passing a laser light over the printing paper to create an electric charge. The printer then deposits powdered ink, also called toner, onto the charged paper and heats it to permanently fuse the ink to paper. Laser printers are much faster than inkjet printers, and high capacity laser printers can print more than 60 pages per minute. The toner that is used in laser printers is less expensive than the ink that is needed for inkjet printers. Laser printers are also very quiet, and they print extremely high quality text, images, and photos. Inkjet printers often have a lower initial startup cost than laser printers. The printer itself will typically be fairly inexpensive, though upkeep, maintenance, and the cost of ink may end up costing more. Inkjet printers are very versatile, and can print on a variety of media, including craft paper, t-shirt transfer paper, and printable CDs and DVDs. They’re usually much smaller than laser printers, and you can easily fit an inkjet printer on your desktop. They’re also available in large format sizes, allowing you to print on 11×17 inch or larger paper sizes. If you have a small office with minimal printing services needs, or if your office equipment budget is low, you should choose an inkjet printer. Inkjet printers are the best office printer for small printing jobs. If you routinely need to print large volumes of documents, or require a high quality color printer, a laser printer is the best type of printer for your needs. When you’re searching for a new office printer near Annapolis , you’ll have to decide between a laser printer and an inkjet printer. The type of printer that you choose will largely depend upon your office’s printing services needs and budget. Inkjet printers are often less expensive, but both types of printers offer a variety of valuable benefits. Watch this video to learn more about the differences between laser printers and inkjet printers. You’ll learn about the pros and cons of each type of printer, so that it will be easier to determine which one is the best office printer for your printing needs. With all of the different types of printers available, it may seem overwhelming to try to find the best office printer in Annapolis . 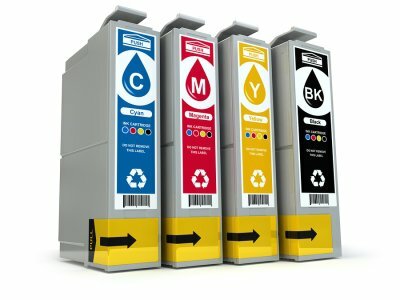 Inkjet office printers are affordable, efficient, and can handle a variety of printing services, making them one of the best types of office printers around. Here is a look at a few of the primary benefits of inkjet office printers. Inkjet printers have always been the least expensive type of printer on the market. Though you are purchasing such an affordable office printer, you will get a wide variety of printing services for your money. You can easily find an office printer that is capable of color copying and printing services, as well as scanning and faxing services. Inkjet printers offer the best value over any other type of printer available. Inkjet printing technology has advanced significantly over the years, though the price of inkjet office printers has not risen significantly. Inkjet office printers utilize high tech software, hardware, and electronics to deliver the best printing quality possible from a desktop office printer. Depending upon the type of printer that you buy, you will also have the option to customize and tweak your printing services and quality to meet your office’s needs and budget. This makes it easy to find a high-quality printer that works well for your offices demands. Offices run on efficiency, and there is no reason why you should not use the most efficient office printer available. Inkjet printers do not require very much time to warm up once they are turned on, and they also have a much faster response time than other types of printers when a document is sent to the printer. Inkjet printers also require less maintenance, troubleshooting, and printer repairs than other types of printers. You will experience far less downtime, and your office will also run much more smoothly and efficiently when using an inkjet office printer.